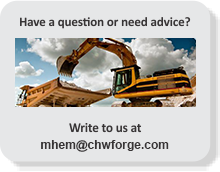 CHW Forge produces large diameter Track Rings in sizes ranging from external diameters of 500 mm to 4500 mm. We manufacture slew rings, rings for slew bearing which are used in industrial applications such as construction, material handling and Heavy Earth moving equipment. KYB Conmat India Pvt. Ltd.
L & T construction Equipment Ltd.